Stockholm's urban park is known as Kungsträdgården, or "King's Garden," because it was used in the 15th century as the royal kitchen garden. Encompassing 40,000 square meters (9.18 acres), it is located in central Stockholm and borders Hamngatan (Harbor Street) to the north and Kungsträdgårdsgatan to the east. Variously described as a public park, town square, amusement park, and botanical garden, Kungsträdgården owes a little to each of its past incarnations, from its royal roots to its service as an army drill-ground. In 1953, it became the site of Stockholm's 700th birthday festivities. Since then, the central portion of the park has been managed as a flexible event and performance space. Managed by: Kungsträdgården Park & Evenemang AB (KPE), a subsidiary of the Stockholm Chamber of Commerce, oversees the management of the park. The Board of the KPE comprises seven deputy members and nine regular members, six of whom are appointed by the Stockholm Chamber of Commerce and three by the City of Stockholm. The members are both politicians and representatives for the Stockholmsmassen (the people of Stockholm), Stockholm Information Service, SE-Banken and the Stockholm Chamber of Commerce. KPE owns the building that houses the Restaurang Akvarium (Aquarium Restaurant). Maintenance: The Stockholm Real Estate, Streets and Traffic Dept. (GFK) is in charge of the park's landscaping, cleaning, and lighting. Security and Hospitality:The police (who are in charge of maintaining law and order in the park, as well as issuing permits for its use) are briefed weekly about the park's upcoming events and activities. For large events, the organizer must be granted special permission from the police and assume responsibilities for any damage to the park. Most of the activities in the King's Garden are run by Kungsträdgården Park & Evenemang. Each year, nearly 150 events are staged in the park, in addition to numerous exhibitions. The stage, which has its own sound and light equipment, as well as a technical and production staff, can be hired for large events or exhibits. In the winter, a large circular plaza in the center of the Kungsträdgården is made into a skating rink, which is operated by the City Recreation Administration. Restaurants are located at the two ends of the garden, with a sunken fountain surrounded by steps located in front of one of the restaurants. Each activity at the park requires authorization by the GFK, as well as a permit from the police; the permits transfer all legal responsibility to the organizer of an event. All activities at the park are dictated by public regulations. In order to facilitate the decision-making procedure, the KPE also has a general permit for the activities; the association is able to autonomously approve on-going activities and small events, but must consult with the GFK for consent for larger events and extensive construction or changes to the park. Any event organizer on the site must comply with the park's mission to respect its vegetation, trees, fixtures, and accessibility. When alcohol is for sale at events, the organizer also needs to get a permit from the County Administrative Board. When an activity involves food consumption, the Miljoforvaltningen must give consent. 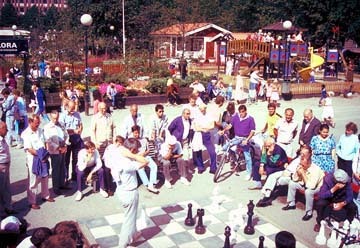 Although the park used to make game equipment, including chess, checkers, and ping-pong, available to visitors during warm weather, many of these activities no longer were possible on so larger a scale after the garden was redesigned in 1998. Formerly, there was also demonstration models of the latest children's playground equipment, which would be donated and change every year; that equipment too was removed following the redesign. Although the park's layout now seems more rigid, with the number of informal activities not as high, the garden is still a popular and well-used place. Everything the public sees and hears is financed by the Park itself, the money coming from a closed economic circuit similar to the sorts of enterprise funds that American park departments use. No tax money, nor national or regional subsidies, are included in the financing of the activities. The kiosks, restaurants and tea gardens pay a rent for the grounds, and this income constitutes the general funds for the financing of the activities in the King's Garden. The stage, including its light and sound equipment, as well as the technical and production expertise of its staff, can be hired -- together with park grounds -- for large events, campaigns and exhibitions. The surplus generated is used for the park's programming and maintenance of its stage, bunting, chess board and landscaping, as well as for the KFP staffing. In this manner, the money stays within the King's Garden to maintain it and support programming and entertainment. Like Bryant Park, Kungsträgården is an example of a public space that, owing to its location in a desirable part of a large city, is self-supporting. This self-sufficiency is accomplished by skilful management, which combines the economic potential of the location with entrepreneurial programming. 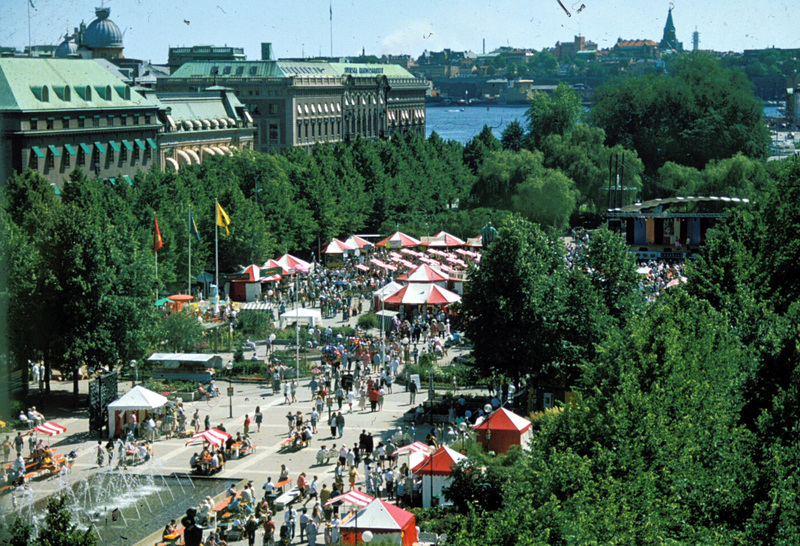 Together, both have turned Kungsträgården into a tourist attraction and asset to the community.